Happy birthday to me! 32! That just seems weird to type! I definitely don't feel 32 and I don't think I look 32, and you know what they say, 32 is the new 22! :) I've always been completely at ease with turning another year older (I've blogged about it multiple times - 29th birthday, 30th birthday, 31st birthday). The 30s are fun and I swear, life gets better by the day! Funny story though - I felt old for the first time ever just recently! I was thinking a month or so ago about being in my eighth year as a teacher. I was 24 when I started teaching, and since I teach high school (and taught seniors back then), I was only a few years older than some of my students. I was always under the impression that the kids liked me, in part, because I was a young teacher. I remember wondering "What are they going to think when I'm older?" Well...I think that time has come. Since I get a year older each year, and my kids get a year younger (really, they're just born a year later), there are now 16 years between myself and most of my students! Sixteen!!!!!! And since I'm 32, that makes me double their age! Wowzers. Like I said, that may be the one and only time I've ever felt old, but boy was that a punch in the face! 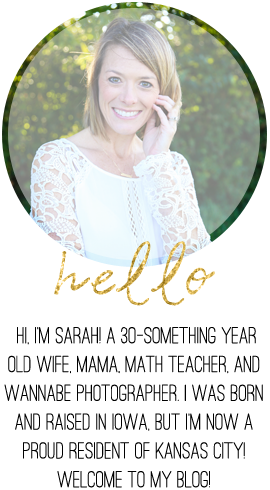 For my 32nd birthday, I'm going to list 32 facts about myself! I've seen this on other blogs when the bloggers turn 30, but since I missed that opportunity, you get 32 fun facts instead! Here we go! 1. I share a birthday with Martin Luther King, Jr. Most people don't know that about January 15. 2. I don't chew gum. 3. I'm not a movie person. I don't dislike movies, but sitting for two hours just isn't my thing. 4. I can twirl a baton! I grew up taking lessons and twirled throughout high school with the marching band. 5. I love to shop, but I don't buy expensive clothing. Target and Old Navy are my jam. 7. I didn't drink until college. And to this day, I don't regret that decision. I've also never smoked. Not even to try it. Not even a cigarette. Not even once. 8. I have little desire to travel abroad. Just take me to the beach and I'm a happy girl! 9. I pride myself on my better-than-average memory. Especially when it comes to dates/years. Especially if the memory is connected to music. 10. I've always been good at math. I was selected for a math competition in middle school and I was beyond embarrassed about going. Now, I am a proud math geek! 11. I'm terrified of spiders. Like scan-the-walls-whenever-I-enter-a-room, freakishly terrified. And I make sure to always wear flip flops around the house in the summer in the case that I see one. Even though when I do, I'm absolutely horrified about killing it. I may or may not have cried for hours upon end after being home alone and seeing a spider. More than once in my life. It's a problem. Really. I'm also scared silly of tornadoes. Like I have dreams (more like nightmares) about them in the spring and summertime! 12. I'm a news-watcher. I rarely miss a day of the local 5:00/6:00/10:00 news. 14. I'd take 100 degrees over 50 degrees any day. 30 and below...let's not even talk about that! 15. I always knew I wanted to be a mom, but I didn't play "house" or "dolls" when I was younger. I enjoyed coloring, crafts, and things like that way more. 16. I text in complete sentences with proper grammar, spelling, capitalization, and punctuation. Anything else drives me crazy! 17. I have lots of pet peeves. They include: losing things, words spelled with numbers (example: 2nite), crumbs left in butter (and other containers), and people who say pregnancy lasts 10 months. 20. I'm not a picky eater. There isn't a lot I don't like, but pork chops is definitely one. 21. I hate working out. And quite honestly, I'd prefer to be an average-size girl and eat ice cream once (or twice) a week, than give up junk food. 22. I hate it when people mis-spell my name. Especially when they're replying to an email and my name is written directly above. Because of this, I make a point to spell other people's names correctly. 23. I'm seriously addicted to chapstick. Must. have. it. at. all. times. 24. I can fall asleep in under 30 seconds. My husband will vouch for this and my family jokes about it often. 25. I love Laffy Taffy! 26. I don't like toothpaste. The smell, the taste...yuck! I rinse my mouth obsessively after brushing until that taste is gone. 27. I also don't like taking showers. It takes time and I hate blow drying my hair. 28. I'm the opposite of creative. But I'm really good at copying, or "being inspired" as I like to say! Thank goodness for Pinterest! 29. I love flying. I think airports are really exciting! However, I despise packing. 30. I bit my nails for about 28 years of my life. I stopped when I was pregnant with Brantley. I still revert back every now and then, but for the most part, my nails are long and strong. 31. I have 1 sibling and 5 siblings-in-law. 5 of the 6 of them are also teachers! 32. I love going to bed early. And with that last fact, I feel old! :) Here's to year 32! I love this post, great idea! I find it a little strange that you don't like to shower but oddly I can relate to that one too, ha! Holden Beckett: 9 Months Old!